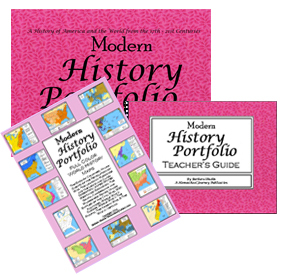 Modern History Portfolio - Classical Homeschool History Curriculum. Research, Read, Write, Illustrate ... Tell the Story. Perfect for families with more than one child using the Modern History Portfolio "classic". *Reflects a discount of $10.00, a 17% savings. The Modern History Portfolio contains landscape oriented cardstock pages, bound in a sturdy and attractive 3-ring binder. Each Portfolio includes a Table of Contents, chapter divisions, black line maps, and a unique timeline. Portfolio pages are specially formatted with a system of frames–referred to as "text boxes" or "image boxes"–for reports and images. *Combine the Portfolio with the Full Color Maps and the Teacher's Guide. The English Colonies, Major Events of the Revolutionary War, The Louisiana Purchase and the Lewis and Clark Expedition, United States Westward Expansion, The South, Cumberland and Wilderness Roads, Major Battles of the Civil War, WWI Alliances, World War II: Europe, World War II: The Pacific, The Korean War, & The War in Vietnam.